Sooooo I'm the proud new owner of an ANDY WARHOL!!!!!! OMG yes! OK, so it's not an actual silk screen of his iconic 'Poppies,' but Nars brilliantly pays homage to Andy Warhol in this incredibly stunning line that will have every beauty junkie screaming for more! 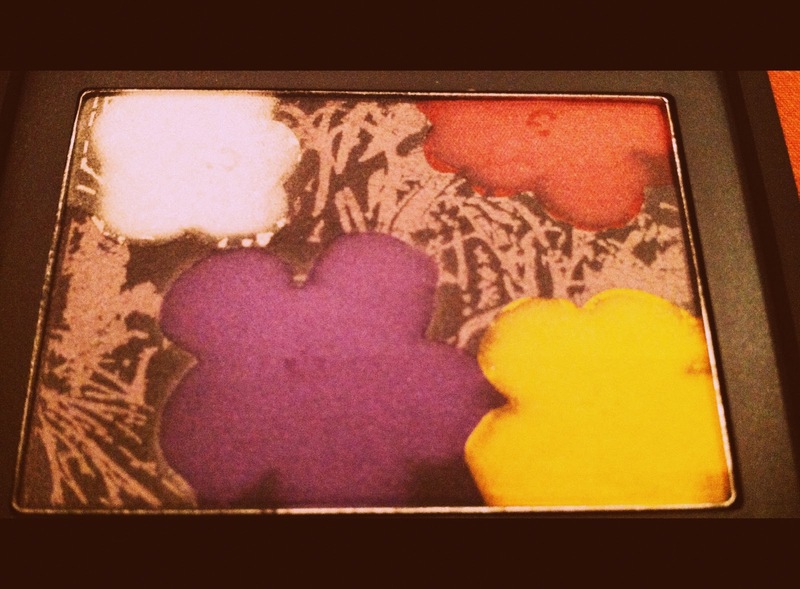 I opted to start my collection with the Flowers 1 eyeshadow palette. I was totally drawn to the vibrant plums, golds and grays. I will tell you that this palette does not disappoint in terms of pigmentation. I've had a blast playing with this colorful wonderland. There's something so special about owning a palette like this one because of it's uniqueness. It leaves you feeling as though you own a gorgeous piece of art. And truthfully, it is a wonderful work of art in its own right! I know you can relate if you are makeup obsessed like meeee! Let this palette unleash the inner artist in YOU... after all, you are your own most perfect canvas right? So tell me, have you tried Nars Andy Warhol collection? Let me know what you think? What should my next purchase be? How sweet is this Andy Warhol quote? "If you can convince yourself that you look fabulous, you can save yourself the trouble of primping." True words! Labels: andy warhol, beauty, eyeshadow, flowers 1 palette, makeup, Nars, nars andy warhol, Sephora. Oh wow that looks so cool! please follow me back via GFC and facebook <3 that would be so fine! Wow sweetie is a wonderful pallet with shinnt and cute colors! I´m your new follower i want invite you to my blog! And... If you want follow me back! Gosh the combo of Warhol and Nars is awesome ! Nice colours for make up :) Very strong! This palette is so adorable! Wow that is really beautiful. I would feel bad using it because I wouldn't want to ruin the flowers haha! So lovely colours! :) I'm your new follower! Hope you can do the same :) Love, D.
oh god, it's so beautiful! !how can I get that? ?hmmmm...pretty inspiring make up kit! following u now!! kisses keep in touch! Oh! I really love those colors, I should check out Nars some time soon! Ohh this looks gorgeous! very tempting! Wow the colours really pop, I need to get myself something from this collection, xoxo. This is a really nice idea :). I'm your new follower (gfc, bloglovin). I love Nars and make-up, great post ! I didnt even realize they were doing this! Cute blog!! Now a follower, I would love if you followed me back! Awesome! I love Andy Warhol! And yes, lets follow each other ;) Following, just follow me back. Gorgeous, definitely on my list! Very pretty palette! Followed you dear! Love your blog & I'm your new follower. I'd love it if you visited mine & maybe follow back if you like! I just stumbled upon this collection recently and only had a chance to browse it briefly... I definitely did not see this eyeshadow palette, because I know if I had, it would have come home with me! It's gorgeous! So glad you featured it, because now I'm off to hunt it down :) Love from your newest follower. oh wow, that collection looks amazing! nice colors..good review! thanks for dropping in earlier..following now *GFC & Bloglovin!visit us back : )! Love the palette! He truly represents pop colors and it would be so fun to be inspired by him when you wear it. It looks like you offer lots of great makeup advice on your blog... of course I will follow you! OMG you look so pretty!!! thanks for sharing your thoughts on the product. Soy fiel seguidora de Nars , adoro esa marca . Btw this palette is just amazing, I love Andy Warhol and these colors are great!! This is great! I saw it the other day in Sephora! I really love this palette and I didn´t know about it! That is an amazing collection by nars! If i had it i wouldnt be able to use it! I love the NARS's cosmetics! Yes, I really enjoyed this review, you are very knowledgeable. I am following you from Rome, I hope you will follow me back. Wow, such gorgeous colors. I'll need to try them, great review! Wow,it looks great,thanks for review. Cool review! I am always on the lookout for new makeup and beauty products to try out as well. :) Will be checking back! Aren't they amazing? I like the Nars Andy Warhol Collection. So artistic and stylish! This palette looks amazing !! Love all the color, very vibrant.